Do you have a life verse? I would say that I don’t. Instead, I tend to have a key verse for a particular life season. Right now, I would claim Proverbs 3:5,6 as the verses I cling to on a consistent basis. Having two teenagers reminds you how much you need to wholly trust God to direct your (and their!) path. I can’t lean on my own understanding. As I continue to learn in my parenting journey, what I think is best for my kids may not always be what God has for them. Whether or not you have a life verse, you likely have certain Bible verses you’ve memorized and continually refer back to. I have a number of them! I think it’s because they contain truths that are relevant to any situation we face. One of mine has to do with peace. While we already talked about some ways we can have perfect peace, this verse reveals to me that prayer leads to peace. I believe there’s a little more to it than just the physical act of saying a prayer about something we’re concerned over. Making my request known to God is the easier part. The hard part is choosing to leave it with Him. Sharing my heart’s desire with God in prayer is all well and good. But if I finish praying, then two minutes later I’m worrying and trying to work it all out in my own mind again, I’m not going to have peace. Merriam-Webster defines peace as a quiet and calm state of mind. That sounds desirable!! I also love the word “tranquil” as a synonym for peace. I think of a still blue lake, with the sun shining down on it, and not a ripple on its surface. To go through my day with a mind that restful and serene would be a blessing! As for “being careful for nothing,” or, in other words, turning all my concerns over to God, I believe that involves submission. It’s me surrendering to however He chooses to answer my prayer. What sweet communion I can have if I commit all of my cares to Him! The peace we receive at that point will “keep our hearts and minds.” Here the word “keep” has to do with watching over or guarding. God’s peace can guard my heart – my emotions and feelings – as well as my mind or thoughts. 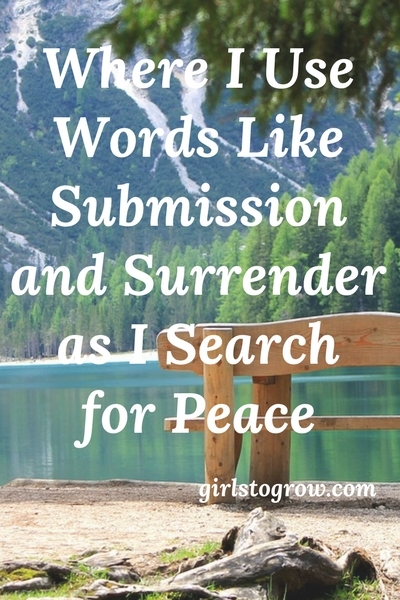 That inward peace guards me from fear, worry, doubt, depression, and so many other attacks against my heart and mind. Our outward circumstances may be rough and stormy, but inwardly, we can have peace. This peace is beyond our understanding. If you’ve ever gone through a trial and had that kind of peace, you know that’s the best way to describe it. There’s no explaining it to someone who hasn’t experienced it. But, as with the verse we looked at last week, the ending here is key. I can’t manufacture this peace. It only comes through Jesus Christ. As our Savior and Lord, He gives us the peace we need. December 9th marked 20 years since what has (so far!) been our family’s most difficult trial, at least humanly speaking. That was the day our first child was born and went to heaven, all within a matter of minutes. I continue to praise God for the peace He gave us during those days. I’m comforted to know that, no matter my trial, His peace is always available! God’s peace is so very comforting, isn’t it?! I love the word tranquil, too: so descriptive. Twenty years! That’s a long time, yet I know it’s something that is never really forgotten. Yes, 20 years is a long time – and I’m sure there are little pieces of that day that I’ve forgotten – but I’m still so thankful for God’s grace and the kind people that surrounded us on that difficult day. In fact, I just mailed a Christmas card to the labor and delivery nurse we had during our hospital stay! She lives in a different state now, but we still keep in touch around this time of year. I wouldn’t say that I have one ultimate life verse anymore now – like you, I feel that certain verses apply strongly at different points in my life. But growing up, my first favorite was Proverbs 3:5-6!!! 😄 And Philippians 4:6-7 became my mantra when times were tough when I was living in Germany in college. “The hard part is choosing to leave it with Him.” YEEEEESSSSSSSSSSSS!